While dealing with business data, 'history' has its own role to play. The 'history' here means, data specific to a point in time. Most of the enterprise application may capture audit information when the user commits a business transaction. These audit data may includes previous value of some sensitive attributes, user who modified the data, modified date etc. ADF BC framework ships with a number of history types, but you can also create your own on need basis. Question here is, who does update these attributes (and when)? Well, this job is done by the ADF BC run time at prepareForDML phase of a transaction post cycle. 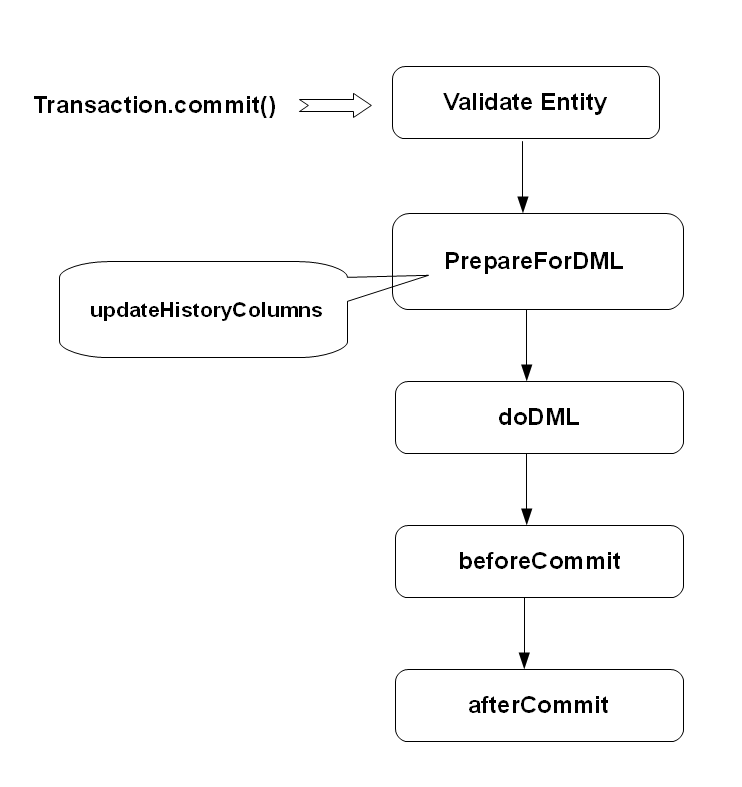 When you commit/post a transaction, Transaction Manager would take each entity object through a transaction post cycle as shown in the following diagram. prepareForDML - Issues pre-doDML ntofication for all entities, this is used to assign history values before an entity row is saved. Run time uses attribute definition to identify the nature of each attribute and takes appropriate actions. 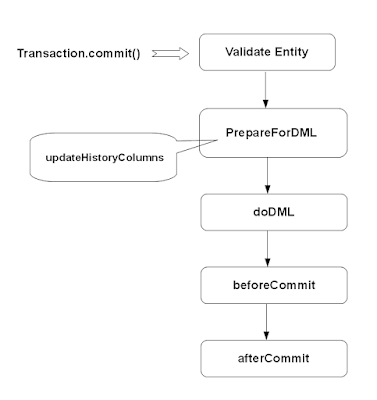 beforeCommit - This is invoked on each modified entity instance after the changes have been posted to the database, but before they are committed. Last chance for you to validate your business data(if you have some data validation logic built using stored procedure, you can hook that call here). This is also a place for invoking third party services passing data from the current entity instance. afterCommit - Send notifications about a change to an entity object's state. This is invoked on the entity instance after committing data to DB. History types are very much extensible in ADF, you can build your own history type without much effort. This part is very well documented in Fusion Developer's Guide, please see topic 38.10 Creating New History Types to learn more. In this post, I'm sharing simple example built using custom history type. This example captures the old value of DepartmentName attribute using DepartmentNameAudit field whenever DepartmentName changes( DepartmentNameAudit is a custom 'history type'). I'm highlighting the steps for creating custom history type used in this example - 'modified value'. 1. Download the source and extract this to you local host. 2. This example uses HR schema. The attribute DepartmentNameAudit in Departments entity is mapped to OLD_DEPARTMENT_NAME column in DEPARTMENTS table. If you want to run the sample, then please add this extra column to DEPARTMENTS table. 4. Modify Department Name field and commit the changes. Please see the corresponding record in you database table(DEPARTMENTS). The column OLD_DEPARTMENT_NAME may have the previous value of DEPARTMENT_NAME. Thank you very much. Till now, we were setting history column values, during each save, explicitly. I have a problem when using the history column. when i update a row twice(update > save > update > save) i get error "Another user has changed the row with primary key oracle.jbo.Key". So I set "refresh after update" to true in entity object. Now the error is minimized to insert and then update on same row(insert > save > update > save). If i try to set "refresh after insert" also to true, db fires null exception for history column. I am working on 11.1.1.2. Is there any settings that can solve my issue? Also if after closing the message, if i try to save, then it works. (insert > save > update > save > save). Actually the problem was with the application I was working on. I tried it on a fresh test application and it works. Also the refresh after update was actually not working. It also resets the value before saving(during updates). But since refresh after insert was not selected, the value will be set during insert. So no change was visible. I have solved the problem by executing the query once again in my application(the problematic one).